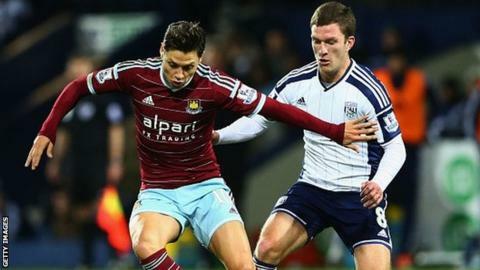 West Ham boss Sam Allardyce will let Argentina striker Mauro Zarate join QPR on loan because he "wasn't good enough" to play regularly at Upton Park. Zarate, 27, was quoted in the national press as saying that Allardyce refused to play him because he was signed by Hammers co-chairman David Sullivan. Allardyce claimed that was "not true" and offered an alternative reason. "He wasn't good enough," Allardyce, 60, replied when asked why Zarate had not featured more for the Hammers. Zarate has scored twice in eight appearances for the Hammers since he joined from Velez Sarsfield last summer. He has fallen behind fellow summer signings Enner Valencia and Diafra Sakho in the pecking order, while Allardyce also has Carlton Cole and Andy Carroll at his disposal. "I base my feelings on what I consider to be the best team. It's a professional, clinical decision, not an emotional one," added Allardyce. "Mauro is not good enough to play as regularly as he wants compared to the others. It's as simple as that."